The stakes have been raised. For the first time since this whole calamitous noise entered the ionosphere back in September 1947 the king of the rock ‘n’ roll hill is NOT named Roy Brown. Worse yet, the new king – on King Records no less, just to drive the point home a little harder – is sitting atop his new throne singing Roy Brown’s SONG! We’re talking of course about the convoluted set of circumstances that led Wynonie Harris to vault over Brown in rock’s pecking order (not to mention about two dozen others who’d been comfortably ahead of Wynonie up to this point) by cutting the very same song that positioned Brown there to begin with and started rock ‘n’ roll in the process. A song that Brown himself had offered to Harris the previous summer only to have Harris essentially tell him, “take a hike, kid, don’t bother me”, leaving Roy to cut Good Rocking Tonight himself after getting a record deal. Once he’d done so he saw that record quickly elevate him from regional club singer to what passed as stardom with the still small and far-flung, but enthusiastically growing new audience attracted to this vibrant new sound. Three months after its release, with the clock ticking before the studios were forced to shudder their doors at midnight heading into the New Year because of another impending recording ban, Harris snuck in the back door, cut the same song he’d haughtily rejected, and now, just a week or so ago as we speak, it had been released and promptly turned around his sinking career. Just for good measure it also positioned Harris to become the emerging face of rock music as his version of Good Rockin’ Tonight began its trek to #1 on the Race Charts, the first rock song to do so. Roy Brown must’ve been pissed. How many artists in rock’s long history would break through first with something only to see their position usurped by someone else? Jimmy Liggins had his groundbreaking Cadillac Boogie refitted for a Rocket 88. Bill Haley was acclaimed as the first white rock star, the focal point of rock’s crossover dreams, only to have Elvis Presley’s swiveling hips push him from center stage soon after. Speaking of hips, those belonging to Hank Ballard were doing The Twist before Chubby Checker got not one but TWO #1 entries with the same song a few years later. The Sonics invented punk rock a decade too early for mass acclaim. DJ Kool Herc laid down the foundations of rap in a Bronx park where there were no cameras or record companies to capture the moment and spread it to the world, so it was left to others to be heralded as the innovators. The Pixies meanwhile saw Nirvana get the worldwide adoration for what they’d already done. The list goes on and on. Some of those names still managed to get a share of the glory but nowhere near as much as they seemed destined for once someone else with a little better timing came along and was celebrated for the same thing in a bigger way. Who was to say Roy Brown wouldn’t be first in that regard too? In some ways historically he was. Harris after all HAS gotten a bit more acclaim for “Rockin” than its originator in the years since, but in the winter of 1948 neither one was thinking that far in advance, only what they could see directly in front of them. Though it’d take awhile for Harris’s record to top the charts, Brown couldn’t have been under any illusions when he first heard it. He had to know he’d been outdone. But a temporary defeat didn’t deprive him of the means with which to fight back. Wynonie Harris may have had the better name recognition, a more dynamic personality suited for stardom, even the stronger record label for promoting him, but Roy Brown had the better voice and he had the better songs, precisely because it was Roy Brown who’d written “Rockin” to begin with, just as he’d written all of his other songs, including two strong sides in December that assured he wasn’t destined to be a one trick pony. But now that Harris had upped the ante Roy Brown had to follow suit, at least stay within hailing distance of the new leader going into the turn or risk falling too far behind and becoming nothing more than a small print footnote in a little read opening chapter of rock’s history book, his role in launching it to begin with destined to be all but forgotten. So there was a lot riding on Brown’s next record. Unless he was clairvoyant he couldn’t have had any idea of the historical implications of his decisions of course, but in the very real and unforgiving present market he was in at the time he had to know that you were only as good as your last success. Decent selling local noisemakers would enable him to keep packing in crowds for the foreseeable future around New Orleans and the surrounding Gulf Coast region, but if he ever wanted to get beyond that and make a name for himself that would open doors wherever he went he needed a calling card that everyone, regardless of their vicinity, knew. What he needed now was a legitimate, no asterisks attached, HIT just to keep up with Joneses, or the Harrises as it were. 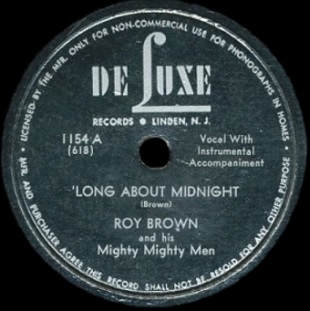 Of course when Roy Brown cut ‘Long About Midnight in December he had no idea that Harris was in a Cincinnati studio about to claim his previous breakthrough anthem for himself, so Brown was merely interested in keeping his own momentum surging forward, not competing with something that had yet to even be put to wax by someone else. It also is important to keep in mind that although this was his fourth professional recording session he was still basically a novice at this whole game, since his first sides had been cut just six months earlier – making him hardly a grizzled veteran when it came to meticulously crafting his musical persona. That he scored with his first effort was potentially a curse as well as a blessing if he should fail to move past that blueprint and come up with something new. He’d stuck pretty close to the original game plan with Mighty Mighty Man, which was just coming out as he stepped into the studio for this side, but he’d also thrown a stylistic curveball with the flip of that record as he shifted from exuberant to despondent for Miss Fanny Brown, so at least he’d shown he’d had it in him to be more versatile. With no feedback yet available for those sides however it’d be interesting to see in which direction he instinctively headed this time out. Would he buck the odds and take a risk to try and expand his musical palette or would he play it safe and revisit his one authenticated success, one that had not just kick-started his own career, but also launched an entirely new style of music that was now being picked up on by scores of artists across the country? If you were taking bets what choice do YOU think he’d make? C’mon, let’s be reasonable, if history (both past and future) was any indicator you could all but count on Brown to recycle the same sound each time out. But either Brown simply didn’t know any better or else he had the biggest set of balls imaginable because he did nothing of the sort. Listening to this record it’s hard to imagine that two years earlier Brown was earning his living singing in a polite inoffensive crooning style. He’d given up on those pop aspirations and started something entirely new when he was forced to sing his composition Good Rocking Tonight on stage rather than let a sideman take it as had been the case prior to that. Now just months after that record turned his world upside down he takes another stylistic left turn and offers up a stark counterpoint to the boisterous rallying cry that defined that song, in the process establishing another crucial element of the emerging rock style, that of the emotive powerhouse on the verge of utter collapse. The amazing thing is he seems to do this without any fear of falling flat on his face. ‘Long About Midnight is an after hours lament that finds Brown wailing in grief throughout, at times almost unable to contain his despondency. His voice is a force of nature when he cuts loose, powerful yet still retaining full control over its emotional nuances. At one moment he’ll raise the roof and bowl you over by unleashing his anguished cries, yet moments later he’ll draw you back in by dropping to barely a whisper, as if confiding in you and you alone the most intimate details of his misery. It’s a tour de force performance vocally, definitively proving that Brown was an entirely deserving star, not some clueless hack who’d simply caught lightning in a bottle. Even before it made its slow crawl up the charts this record showed that he could be counted on going forward to deliver a wide range of material that would go on to shape and define the style as it emerged even further. Also this is one case where the unfortunate drawbacks of his earlier sides – those nefarious trumpets that were a unwelcome reminder of previous stylistic ground rules that rock was in the process of demolishing – aren’t as much of a hindrance. While the trumpet-centric arrangement used here can’t compete with the raunchy saxes that defined Harris’s take on Good Rockin’ Tonight, which along with the added back beat is what set it apart from Roy’s original, here those trumpets are much more appropriate than when he was forced to rely on them in the past. In a way they actually make the mood of the song even more somber, as trumpets tend to “cry” more than saxophones, so while it may not be as forward looking as what Harris just came out with, they’re nevertheless completely effective for what Brown has set out to do, which is make you ache for his plight. But no matter your views on the brass section, you surely aren’t listening closely to the horns for long, not when Roy bellows to the heavens, cursing fate for the loss of his mother, his friends, his money and his girl and who knows what else. He captures your attention with that voice from the moment he opens his mouth and demands you remain riveted on the depths of his despair no matter how painful it may be until the very end. Every emotional plateau he reaches within the song – and there are many – is followed by yet another even more imposing peak he must scale and he does so with amazing self-assurance. It’s an acting job, sure, but an utterly authentic and masterful one at that. He’s pulling shards of glass from his soul in a way that hadn’t ever been heard before in popular music and he’s making the grimness of it all sound somehow captivating. Rather than a gory train wreck that finds you cringing and looking away uncomfortably so as to try and shield yourself from his pain, here you remained transfixed on it because he’s so willingly inviting you to gawk at him in his misery as a form of cathartic healing. Sadomasochism on wax like Brown serves up here has rarely been so potent. Somehow, despite it putting the listener through the emotional wringer, ‘Long About Midnight managed to actually hold serve for Brown in his struggle for rock supremacy with Wynonie Harris. Though Harris would hit #1 on Billboard‘s charts first (in June), Brown would eventually follow him there with this, though amazingly it’d take until next December for “Midnight” to climb to the top of that mountain itself, but he made it all the same and in the process expanded the stylistic territory a little bit further while also proving to one and all that he was going to be a contender for rock’s crown for the foreseeable future no matter what Harris or anybody else did in the meantime. The battle was now officially on, may the best man win. Leave a reply on "Roy Brown: “Long About Midnight”"